Purchase three bottles of the same product in 1oz. or 4oz. size , and receive the 4th bottle free. To take advantage of the special, the three bottles purchased and the FREE bottle must be the same product and purchased at the same time. Red Clover Blended Pure Herbs Liquid Extract used Historically for Bad Cells, blood cleanser, tumors, lymphatic, skin disorders, kidneys. This combination was made famous by a desperate amateur American herbalist, Jason Winter. Necessity being the mother of invention, he cured himself of cancer. In the process, he developed this herbal combination to do the job. Now many others have used this combination and report similar results and claims for its effectiveness in eliminating bad cells. The herbal components of the formula perform strongly together as a team to increase each others effect over what they produce if taken separately. Greasewood by itself has a long history of having been used to dissolve “bad cells” and tumors by the American Indians in the desert southwest. Red Clover is the prime herbal alterative (regulating herb) of northern American Indians, for counteracting scrofulous (lymphatic) disorders and skin “dis-eases,” and as an antidote for “bad cells.” It is also a specific for the kidneys and thereby, helps with the removal of toxic material from the body. Buchu is known to be rich in potassium and facilitates the removal of irritating poisonous wastes from the blood and lymph through the kidneys while at the same time immediately soothing any inflammation that might be caused from poisons being eliminated. Buchu provides the spark, which coordinates this highly effective herbal team. Cancer is not normal and can be overcome and prevented! You need not live with the fear of this condition of "bad cells". There is hope, and here is one answer to cancer. Dissolves cancers and tumors, blood cleaner, corrects leukemia. Cleans bone marrow. Take as a preventative. 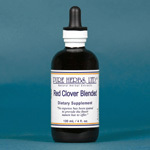 Red Clover Blended is taken internally; and one very successful procedure to speed up its activity is the use of Red Clover Blended externally. COMBINATION: Red Clover, Greasewood (Chaparral) Buchu. EXTERNAL APPLICATION: Work in this manner: Each night, apply Vitamin E from 100 or 400 i.u. capsules (International Unit, a measure of liquid vitamins) to the area as an oxygen extender (“bad cells” and tumors cannot exist in areas of good oxygenation), then apply Oil of Cajeput (decongestant and pain reliever), next, apply Herbal Adj. (increases circulation and pain reliever). Then, soak a single layer of cheesecloth or absorbent gauze with Red Clover Blended and wrap this around, or place over, the area to be corrected. Cover this with plastic sandwich wrap to form a thermal and moisture barrier and drive the herbs into the area, while pulling poisons out through the skin. In the morning, remove and discard the application. Wash the area and allow to dry. Then repeat the application procedure for the daytime just as you did for the nighttime. Repeat in this fashion until well.